Jordan Rhodes scored a last-minute winner as Huddersfield progressed to the Carling Cup second round at the expense of Carlisle. He converted an easy chance in the area from Lee Novak's cross, with the home defence split wide apart. Rhodes had hit the bar twice in a three-minute period in the second half. Carlisle's best chance came in the first half and saw James Berrett and Gary Madine have close-range blasts blocked in a goalmouth scramble. "We've played two away games, we've had two clean sheets, we've had two wins. "I want the players to set good standards, part of the make up of the squad now is that they're resolute and with the help of some of the experienced lads at the back that we have we can do this. "There's going to be other occasions this season where we have to withstand a lot of pressure, ride our luck a little bit and nick the game." 95:07 The game gets underway. 90:00+3:48 Goal kick taken long by Alex Smithies (Huddersfield). 90:00+3:29 Effort on goal by Ian Harte from just inside the penalty area goes harmlessly over the target. 90:00+2:57 Corner taken by James Berrett, Peter Clarke manages to make a clearance. 90:00+2:35 Defending throw-in by Frank Simek (Carlisle). 90:00+1:34 Substitution Carlisle substitution: Paul Thirlwell replaced by Marc Bridge-Wilkinson (tactical). 90:00+1:34 Substitution Marc Bridge-Wilkinson replaces Paul Thirlwell. 90:00+1:08 Attacking throw-in by Sean McDaid (Carlisle). 90:00+0:38 Attacking throw-in by Lee Peltier (Huddersfield). 90:00+0:15 Goal kick taken long by Alex Smithies (Huddersfield). 88:56 Lee Novak provided the assist for the goal. 88:56 GOAL - Jordan Rhodes:Carlisle 0 - 1 Huddersfield Jordan Rhodes finds the net with a goal from close in to the bottom right corner of the goal. 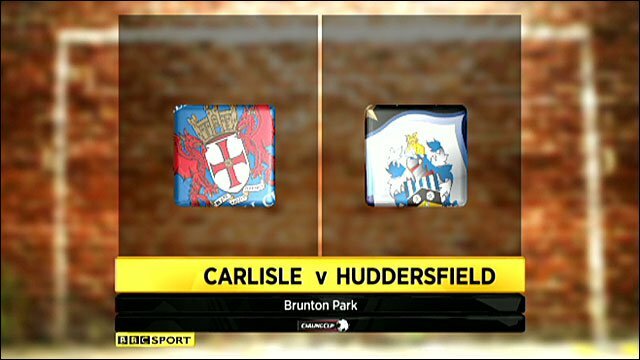 Carlisle 0-1 Huddersfield. 88:25 Goal kick taken long by Alex Smithies (Huddersfield). 87:55 Free kick awarded for an unfair challenge on Gary Madine by Peter Clarke. Free kick taken by James Chester. 87:41 Goal kick taken long by Alex Smithies (Huddersfield). 86:57 Substitution Lee Novak comes on in place of Joe Garner. 86:17 Adam Collin takes the free kick. 86:17 Booking Caution for Joe Garner. 85:55 Joe Garner gives away a free kick for an unfair challenge on Sean McDaid. 84:19 Matthew Robson produces a right-footed shot from inside the area that clears the crossbar. 83:31 Defending throw-in by Gary Naysmith (Huddersfield). 82:59 Goal kick taken long by Alex Smithies (Huddersfield). 82:17 Attacking throw-in by Gary Naysmith (Huddersfield). 81:24 Attacking throw-in by Lee Peltier (Huddersfield). 81:24 Substitution Matthew Robson is brought on as a substitute for Francois Zoko. 80:54 Attacking throw-in by Frank Simek (Carlisle). 80:29 Attacking throw-in by Gary Naysmith (Huddersfield). 79:31 Jordan Rhodes has an effort at goal from deep inside the area missing to the right of the goal. 78:00 Foul by Jamie McCombe on Francois Zoko, free kick awarded. Ian Harte restarts play with the free kick. 76:49 Substitution Huddersfield substitution: Gary Roberts replaced by Graham Carey (tactical). 76:49 Substitution Graham Carey joins the action as a substitute, replacing Gary Roberts. 75:18 Foul by Damien Johnson on Frank Simek, free kick awarded. Free kick taken by Ian Harte. 74:51 Defending throw-in by Frank Simek (Carlisle). 74:21 Goal kick taken long by Adam Collin (Carlisle). 73:55 Jordan Rhodes has an effort at goal from the edge of the box that misses to the right of the target. 72:20 Inswinging corner taken right-footed by James Berrett from the right by-line, Joey Gudjonsson manages to make a clearance. Inswinging corner taken from the right by-line by James Berrett, Gary Madine produces a header from deep inside the six-yard box that clears the crossbar. 71:13 Indirect free kick taken by Alex Smithies. 71:13 Booking The referee books Tom Taiwo for unsporting behaviour. 71:05 Tom Taiwo challenges Joe Garner unfairly and gives away a free kick. 70:06 Craig Curran takes a shot. Inswinging corner taken right-footed by James Berrett from the right by-line to the near post. 69:43 Goal kick taken long by Alex Smithies (Huddersfield). 69:22 Effort from the edge of the box by Gary Madine goes wide of the left-hand post. 68:59 Jordan Rhodes takes a shot. Save by Adam Collin. 67:10 Unfair challenge on Gary Madine by Peter Clarke results in a free kick. Free kick taken by Ian Harte. 66:50 Attacking throw-in by Sean McDaid (Carlisle). 66:25 Corner taken right-footed by Joey Gudjonsson. 65:53 Header from close range by Jordan Rhodes bounces off the post. 65:17 Free kick awarded for a foul by Sean McDaid on Joe Garner. Joey Gudjonsson takes the free kick. 64:55 Goal kick taken long by Alex Smithies (Huddersfield). 63:53 Gary Madine takes a shot. Save made by Alex Smithies. Corner taken right-footed by James Berrett. 63:33 Attacking throw-in by Frank Simek (Carlisle). 63:14 Attacking throw-in by Frank Simek (Carlisle). 62:50 Attacking throw-in by Frank Simek (Carlisle). 62:03 Craig Curran crosses the ball, Peter Clarke makes a clearance. Inswinging corner taken right-footed by James Berrett, Alex Smithies makes a clearance. 60:48 Defending throw-in by Sean McDaid (Carlisle). Correction - 60:10 Tom Taiwo takes a shot. 59:25 James Chester concedes a free kick for a foul on Jordan Rhodes. Free kick taken by Gary Naysmith. 57:50 Attacking throw-in by Gary Naysmith (Huddersfield). 57:34 Attacking throw-in by Anthony Pilkington (Huddersfield). 57:10 Joey Gudjonsson takes a inswinging corner. 55:49 Substitution Scott Arfield leaves the field to be replaced by Damien Johnson. 55:49 Francois Zoko produces a header from just outside the box that misses to the right of the net. 54:44 Corner taken right-footed by James Berrett, Peter Clarke makes a clearance. Corner taken by James Berrett. 54:11 Attacking throw-in by Frank Simek (Carlisle). 53:53 Defending throw-in by Gary Naysmith (Huddersfield). 53:13 Shot from just outside the box by Gary Roberts goes over the bar. 52:53 The official flags Gary Madine offside. Indirect free kick taken by Alex Smithies. 52:13 Corner taken by Joey Gudjonsson from the right by-line. 51:11 Attacking throw-in by Lee Peltier (Huddersfield). 50:43 Attacking throw-in by Lee Peltier (Huddersfield). 49:58 Goal kick taken long by Adam Collin (Carlisle). 49:42 Defending throw-in by Gary Naysmith (Huddersfield). 48:50 Shot by Gary Madine from outside the box goes over the target. 48:12 Goal kick taken long by Adam Collin (Carlisle). 47:49 Corner taken by Joey Gudjonsson from the left by-line. 47:23 Sean McDaid challenges Anthony Pilkington unfairly and gives away a free kick. Lee Peltier restarts play with the free kick. 45:46 Free kick awarded for a foul by Gary Madine on Jamie McCombe. Direct free kick taken by Alex Smithies. Anthony Pilkington challenges Sean McDaid unfairly and gives away a free kick. Sean McDaid takes the direct free kick. 45:20 Free kick awarded for a foul by Jordan Rhodes on Sean McDaid. Ian Harte takes the free kick. 45:00+0:49 Goal kick taken long by Adam Collin (Carlisle). 45:00+0:10 Craig Curran fouled by Peter Clarke, the ref awards a free kick. Direct free kick taken by James Berrett. 43:23 Craig Curran gives away a free kick for an unfair challenge on Jamie McCombe. Free kick taken by Alex Smithies. Francois Zoko handles the ball and concedes a free kick. Joey Gudjonsson takes the direct free kick, Anthony Pilkington takes a shot from just outside the penalty area which clears the crossbar. 42:28 Shot from deep inside the area by Gary Madine clears the crossbar. 42:16 Anthony Pilkington sends in a cross, save by Adam Collin. 42:00 Attacking throw-in by Gary Naysmith (Huddersfield). 41:32 Attacking throw-in by Gary Naysmith (Huddersfield). 41:11 Attacking throw-in by Gary Naysmith (Huddersfield). 40:54 Attacking throw-in by Gary Naysmith (Huddersfield). 40:02 Effort from inside the area by Joey Gudjonsson misses to the right of the target. 39:28 Handball decision goes against Francois Zoko. Direct free kick taken by Alex Smithies. 38:50 Goal kick taken long by Adam Collin (Carlisle). 37:51 Defending throw-in by Lee Peltier (Huddersfield). 37:28 Defending throw-in by Frank Simek (Carlisle). 37:17 Attacking throw-in by Frank Simek (Carlisle). 36:57 Goal kick taken long by Adam Collin (Carlisle). 36:31 The ball is sent over by Gary Roberts, Jordan Rhodes produces a left-footed shot from inside the six-yard box that clears the bar. 35:25 James Berrett takes a outswinging corner. 34:29 Unfair challenge on Gary Madine by Gary Naysmith results in a free kick. Ian Harte takes the free kick, Gary Madine takes a shot. Paul Thirlwell makes a clearance. 34:03 Goal kick taken long by Adam Collin (Carlisle). 32:34 Craig Curran is caught offside. Alex Smithies takes the indirect free kick. The assistant referee flags for offside against Joe Garner. Adam Collin takes the indirect free kick. 31:57 Goal kick taken long by Alex Smithies (Huddersfield). 31:49 The ball is delivered by Craig Curran. 30:31 Corner taken right-footed by James Berrett, Peter Clarke manages to make a clearance. 28:56 The ball is swung over by Craig Curran, save made by Alex Smithies. 28:26 Defending throw-in by Frank Simek (Carlisle). 27:39 Attacking throw-in by Gary Naysmith (Huddersfield). 26:11 Defending throw-in by Lee Peltier (Huddersfield). 25:39 Joey Gudjonsson takes a inswinging corner to the near post. 25:26 A cross is delivered by Joe Garner, clearance by Frank Simek. 25:15 Defending throw-in by Sean McDaid (Carlisle). 24:35 Goal kick taken long by Alex Smithies (Huddersfield). 24:26 Attacking throw-in by Sean McDaid (Carlisle). 24:04 The ball is swung over by Frank Simek, Alex Smithies manages to make a clearance. 23:34 Attacking throw-in by Sean McDaid (Carlisle). 23:06 Goal kick taken long by Adam Collin (Carlisle). 22:39 Defending throw-in by Sean McDaid (Carlisle). 21:45 Anthony Pilkington challenges Sean McDaid unfairly and gives away a free kick. Free kick taken by Adam Collin. Free kick awarded for an unfair challenge on Jamie McCombe by Gary Madine. Direct free kick taken by Lee Peltier. 20:56 Centre by Gary Madine. 20:20 Attacking throw-in by Frank Simek (Carlisle). 19:50 Inswinging corner taken right-footed by James Berrett from the right by-line. 19:35 Centre by Craig Curran, clearance by Lee Peltier. 18:45 Paul Thirlwell has a shot on goal from outside the box which misses left. 17:58 Defending throw-in by Sean McDaid (Carlisle). 17:37 Attacking throw-in by Lee Peltier (Huddersfield). 17:03 Goal kick taken long by Alex Smithies (Huddersfield). 16:48 Attacking throw-in by Sean McDaid (Carlisle). 16:25 Defending throw-in by Sean McDaid (Carlisle). 15:06 Unfair challenge on Gary Roberts by James Berrett results in a free kick. Alex Smithies takes the free kick. 14:19 Shot from close range by Jordan Rhodes misses to the right of the target. 13:45 Unfair challenge on Alex Smithies by Craig Curran results in a free kick. Free kick taken by Alex Smithies. 11:45 Booking Lee Peltier booked for unsporting behaviour. 11:25 Lee Peltier concedes a free kick for a foul on Francois Zoko. James Berrett takes the free kick. 10:51 Goal kick taken long by Adam Collin (Carlisle). 8:44 Free kick awarded for a foul by Ian Harte on Joe Garner. Free kick taken by Joey Gudjonsson. 8:44 Booking Ian Harte is cautioned. 7:43 Francois Zoko has an effort at goal from deep inside the area missing to the right of the goal. 7:02 Inswinging corner taken by Joey Gudjonsson from the right by-line, Scott Arfield takes a shot. Save by Adam Collin. 6:32 Attacking throw-in by Gary Naysmith (Huddersfield). 5:38 Defending throw-in by Frank Simek (Carlisle). 4:37 Paul Thirlwell challenges Joe Garner unfairly and gives away a free kick. Joey Gudjonsson crosses the ball from the free kick right-footed from right channel, James Chester gets a block in. 4:02 Joe Garner challenges Gary Madine unfairly and gives away a free kick. Free kick taken by Ian Harte. 3:36 Joey Gudjonsson takes a corner. 3:18 Shot from just outside the box by Anthony Pilkington goes over the crossbar. 2:45 Corner taken by Joey Gudjonsson from the left by-line. 2:04 Outswinging corner taken from the right by-line by Joey Gudjonsson, clearance made by Sean McDaid. 1:24 Defending throw-in by Sean McDaid (Carlisle). 1:04 Defending throw-in by Lee Peltier (Huddersfield). 0:34 Effort on goal by Francois Zoko from inside the area goes harmlessly over the bar. 0:05 Defending throw-in by Lee Peltier (Huddersfield).